Many varieties of citrus are now in peak season. The largest of this group of fruits is known as jabong in the islands. It is also popping up in farmer's markets and in Chinatown, just in time for the Lunar New Year. This treasured fruit, symbolizing abundance, is a must to ring in the Year of the Sheep. The basics: Pomelo, or pummelo, is also referred to as shaddock (for the captain who introduced it to the Bahamas and Jamaica) or jabong (probably a name of Chinese or Southeast Asian origin). The fruit, believed to be the ancestor of the grapefruit, is native to Southeast Asia (mainly Malaysia), and was introduced to China around 100 B.C. Pomelos come in a variety of shapes, from round to pear-shape, and vary in size from cantaloupe-sized to larger than a basketball. The pulpy flesh ranges from light yellow to ruby red and is covered by a thick rind and encased in a thick, fibrous membrane. The flesh is less juicy than a grapefruit's, but with the same sweet-to-tart taste. 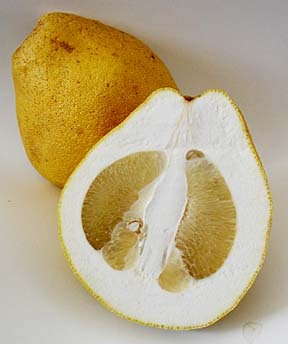 Pomelos are grown all over Asia and the Pacific, in addition to the Caribbean. In the United States, pomelos are grown commercially in Florida, California and Hawaii. Like other citrus fruits, pomelos are a good source of vitamin C.
Selecting: Choose fruit that is heavy for its size and free of blemishes. Pomelos from California and Florida should be ready to eat at the time of purchase. Some of the local jabong, however, could benefit from a couple of days out on the counter until a fragrant citrus smell is evident. Storing: Whole pomelos can be left out for a couple of days or so, but your best bet is storage in the refrigerator, where it should last a couple of weeks. If the fruit is too large, peel and segment the flesh first. Use: Pomelos can be used in the same manner as grapefruit -- as is, or added to salads or desserts. Cut off both ends of the fruit, then cut the remaining rind down to the pulp. Remove all of the white pith, then cut segments from the membrane. The rind can also be made into a candied treat. Where to buy: Farmer's markets and Chinatown should have a good supply right now. Some supermarkets are carrying smaller, smooth-skin pomelo from California and Florida. Prices range from $1 to $1.99 a pound.